Tod Browning, known for his horror film productions, delivers a true classic in American horror for Carl Laemmie’s Universal Pictures. 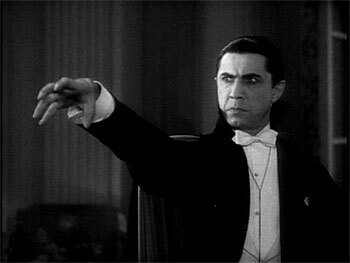 Bela Lugosi, the Hungarian born actor, was cast as Count Dracula, after Lon Chaney Sr. unexpectedly died of throat cancer. Though he provided one of the most memorable performances in an American horror film, Lugosi would later regret being typecast. The film is a clear homage to Nosferatu, which was banned from movie theaters after the heiress to the Stoker fortune sued for the rights of the Dracula story. 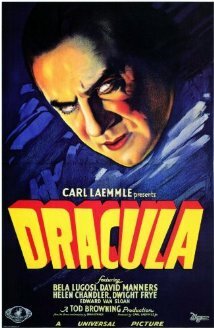 For this 1931 adaptation, Laemmie made sure to acquire the rights to the story before producing the film, although some scenes are clearly directed at the earlier expressionist film, such as a scene in which the main character pricks blood on his finger at the castle of Dracula. The film begins as a carriage full of travelers is racing through the Borgo Pass to make it to a remote Inn before sundown. The locals fear the evils that happen after sundown. One traveler, Renfield, is unafraid of the dark and commissions his driver to take him further to Dracula’s castle, despite the time. He says he has business to take up with Count Dracula. As he approaches the castle, the audience gets its first glimpse of the 500 year old Dracula emerging from his coffin with his three undead brides. Suddenly Dracula, himself, is the coachman for the buggy and as they arrive at the castle, Renfield sticks his head out the window of the carriage to find that no one is driving, but rather that a bat is leading the way. When he enters the castle, he is greeted by a tuxedo wearing Dracula. He leads him to his quarters as they discuss the London real estate for sale and Dracula drugs him with old wine. He and his wives then close in on the body for blood. Days later, Renfield and his “master” Dracula are aboard the stormy ship called Vesta as they make their way to London. Mysteriously, the ship enters the harbor with everyone dead, excluding Dracula and Renfield. Later, Dracula meets a group at the opera house, and the women fall victim to him that night. Meanwhile, Renfield has been moved to the Seward Sanitarium where he feeds on the blood of flies and other small creatures. The doctors in London have trouble identifying the cause of the mysterious marks that appear on peoples’ necks, until Professor Van Helsing accurately attributes them to a Nosferatu, Vampire. When he first meets Dracula, Van Helsing notices he does not appear in mirrors, which forces Dracula to excuse himself. He takes another victim, Mina, and Renfield takes a victim, the maid. Dracula takes Mina back to his crypt, but he is followed by Van Helsing and Doctor Harker. Dracula, feeling betrayed, kills Renfield and flees to his coffin. Shortly thereafter, Van Helsing and Harker drive a wooden stake through his heart and they escape with Mina as church bells ring off in the distance. Dracula is a classic film mainly for its novelty as a staple of American cinematic culture. Otherwise, the film is clunky and awkward at times (the scenes of the storm-wrecked ship were even lifted from another film). The film is also inferior to its memorable predecessor, Nosferatu: A Symphony of Horrors by F.W. Murnau. However, Dracula still manages to horrify audiences. It is certainly a film worth seeing once.